Sleek lines, modern windows and contemporary exterior finishes create a serene and elegant façade. Enter to discover an enclosed foyer with closet to organize shoes and coats allowing you to step within to your own personal Zen. An open concept living and activity area benefits from subtle separation without cutting off any areas. A surprisingly generous kitchen includes an island eating bar and easily flows to the adjoining dining area. The sleeping wing includes two bedrooms or a master plus den/office which is so popular with empty nesters or professional couples. A generous bathroom boasts a host of amenities including laundry closet, separate shower and soaker tub, and ample storage. An unfinished basement could be developed to suit one’s tastes with additional bedrooms, media room or fitness space… or all of the above! With a small footprint, this lovely home is easy on the budget and nurturing to the soul! Looking for other Single-Storey or Modern Contemporary House Plans? 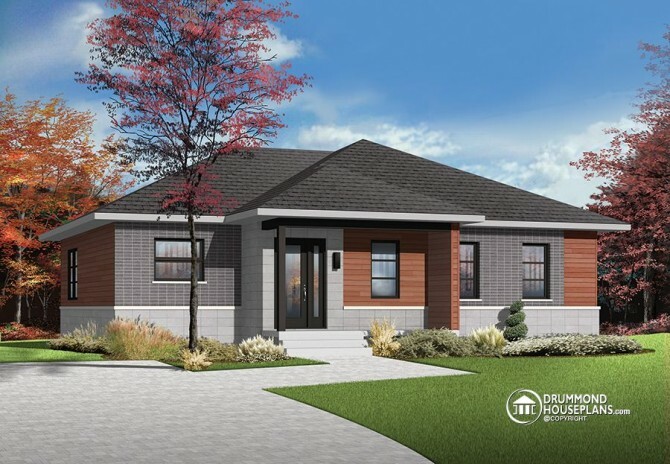 Check our Bungalow and One-Level Design Collection, Modern Contemporary Design Collection, or use our Advanced Plan Search to find homes with specific features.